Continuing to update the Internet on some of the contents of my father’s bedroom, I now bring you a bag of items that, at first I thought belonged to my dad, but then realized they belonged to my Uncle Don. You may or may not remember me talking about my Uncle Don. I am named after him. 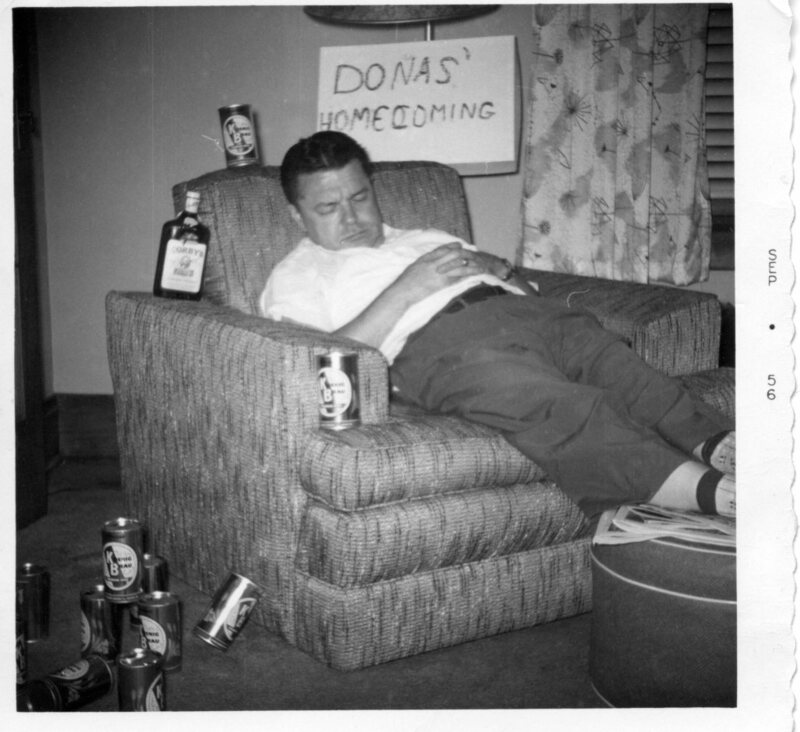 My parents didn’t have a girl’s name picked out when I was born and he suggested Dona Lee. His middle name was Leroy. He, as I’m sure you’re sick of hearing, was very special to me. Here he is the day my parents brought me home from the hospital — a few weeks after I was born. Of course it is set up. I think. And yes, the misplaced apostrophe bothers me too. The largest item in the Ziploc®bag is a sash that I’m sure he wore as a Legion of the Moose member. 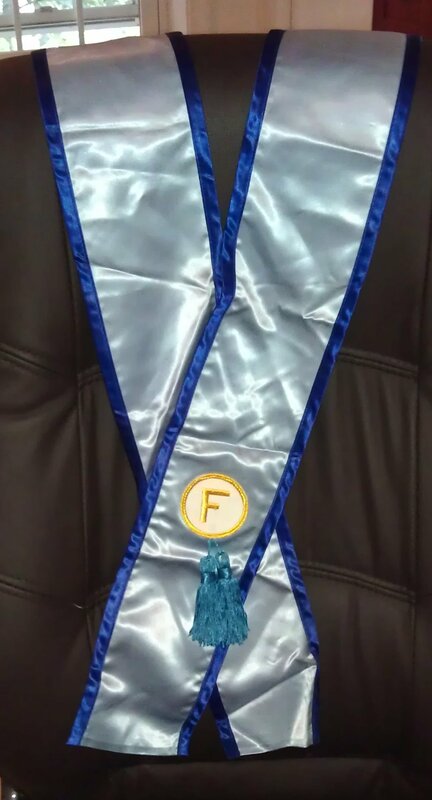 I can almost imagine a roomful of men wearing these sashes. Especially when paired with the matching hat. This next item I thought at first was another hat (and even tried it on), but I think it was a nameplate cover for when Uncle Don went to meetings at other Moose lodges. There were probably stands to put the felt covers over so others in the audience could see who you were and what lodge you came from. Kinda like at the United Nations (but back then only white men could join the Moose). 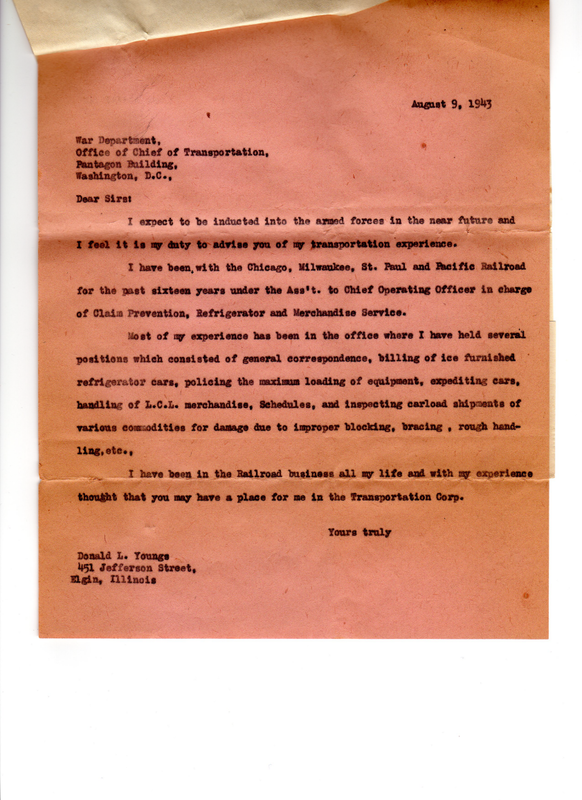 While my Uncle Don was very active in the Moose Lodge, his day job was with the Chicago, Milwaukee, St. Paul, and Pacific Railroad (or simply the Milwaukee Road). In the bag were a few items from his work life. 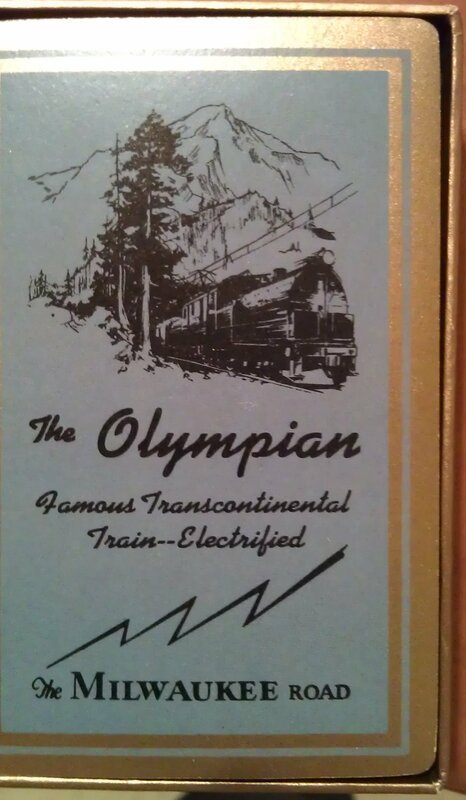 There were two sets of never opened playing cards in the bag whose backs commemorated the Olympian Passenger train and whose “Jokers” showed a map of the line. The last item is my favorite. 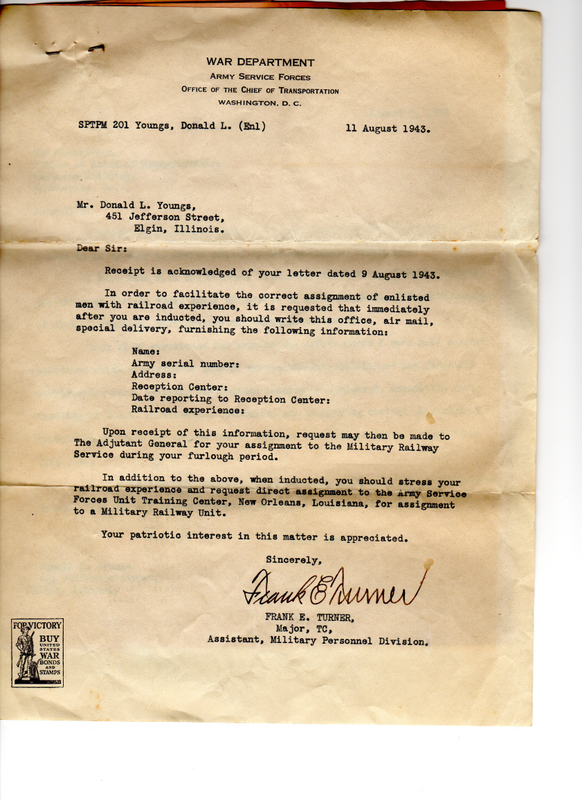 It is a correspondence between my Uncle Don and the United States War Department in August of 1943. 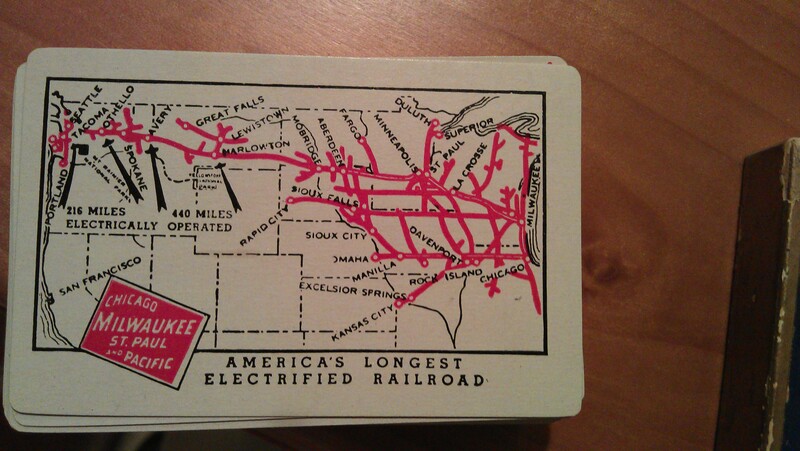 I had no idea he began working for the railroad in 1927, which was the year before my dad was born. I wonder how old he was when he began working. I didn’t think he was that much older than my dad, but I guess he was a contemporary of my mom’s parents. The response from the War Department I wonder if this Frank Turner (Federal Highway Administrator in the 1969-1972) is the one who signed this letter. And the envelope in which it arrived. My Uncle Don must not have been inducted into the military — I’ve never heard stories about him being in World War II. I suspect he was not drafted; or if he was his lack of height may have prevented him from going to war. It was fun going through the bag and figuring out what each of the objects was. I enjoyed reading words that he wrote nearly 70 years ago. Once again, I’m glad my parents kept the things they kept. Since you’re glad your parents kept these things (and I don’t blame you), you probably aren’t inclined to sell them. But I’m sure some of the items have value as collectibles. I sold a number of my in-laws’ decks of playing cards on eBay, to collectors worldwide. Non-collectors like me are always surprised at what people are willing to pay. I smiled at the references (in Frank Turner’s letter) to Special Delivery (long gone) and “patriotic interest” (not gone, exactly, but not quite the same, I’d say). Yeah, not ready to get rid of anything yet. One of these days perhaps. No more special delivery? Oh no! Do you know how disconcerting the title of this post is?? Gives me the willies everytime I see it on my RSS feed! I’m glad that it actually wasn’t Uncle Don himself in the ziploc bag, but think it is lovely that the contents of the bag brought him back to life for you. I had the same reaction as Mali when I read the title. And I agree with Indigo, fascinating stuff. I think that the misplaced apostrophe goes perfectly with the scattered beer cans!